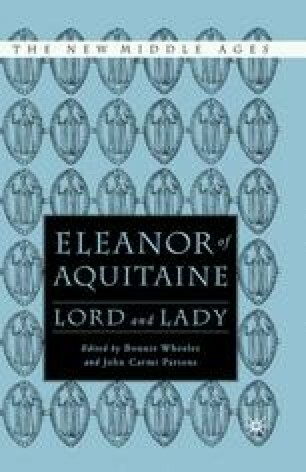 The aim of this study is to examine carefully the political role, the means of action, and the power that Eleanor of Aquitaine, queen of France and England, exercised in her hereditary duchy, Aquitaine. Annals and chronicles alone have previously been scrutinized; the charters that are an obligatory aspect of any such study of seigneurial power have been too much ignored until now. Fifty of Eleanor’s charters survive from the fifty-two years considered here, those of her marriages to Louis VII of France (1137–52) and then to Henry II of England (1152–89).1 Her surviving acts are undeniably fewer, more scattered, and less complete than those of her male counterparts. But by considering where Eleanor issued her acts, in whose favor, under what title, and with what witnesses, it is nonetheless possible to extract some information about her part in the duchy’s government, the times when she was active there, and the methods she used. Her place within family and lineage as revealed by these charters, and the authority accorded her seal (that is, her capacity to authenticate her acts by herself, even when she was not merely confirming someone else’s act), witness the reality and extent of her power. Finally, when the witnesses to her acts are recorded, we can reconstitute the personnel of her retinue to illuminate the extent of her prestige and influence, and better understand the ways in which she integrated herself in the power relations among lords and exploited them to her own ends. The charter evidence reveals that the role played by Eleanor in her duchy during her two royal marriages is quite different from its traditional depiction.